Emilio Sánchez began his artistic training, after moving to New York City in 1944, at the Art Students League. His early works from the 1950s are stylized and figurative, depicting subjects such as portraits of friends and models, views of New York and tropical landscapes. In the 1960s he began to develop his well-known paintings of architectural themes that he further explored throughout the 1970s and 1980s. 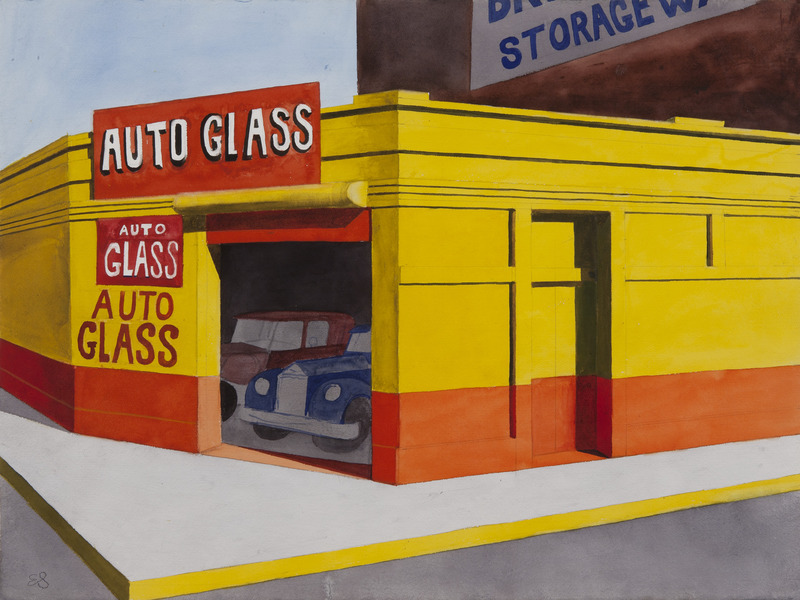 In the 1990s Sanchez's attention shifted focus, and he began to depict New York urban scenes of storefronts, garages and skyscrapers. Sanchez has had over sixty solo exhibitions and has been included in numerous group shows in museums and galleries in the United States, Latin America and Europe. His work is well represented in private and public collections including the National Museum of Fine Arts in Havana; the Museum of Modern Art (MoMA) in New York, NY; the Philadelphia Museum of Art in Philadelphia, Pennsylvania; the Metropolitan Museum of Art in New York, NY; the National Gallery of Art in Washington, D.C.; the Museum of Modern Art in Bogota, Colombia; and the Smithsonian American Art Museum in Washington, D.C.. He has also received prestigious awards, such as the First Prize at the San Juan Biennial in San Juan, Puerto Rico, in 1974..
Auto Glass, Late 1980's. Watercolor on paper. 22 1/2 x 30 in. Orange Garage. Late 1980's Watercolor on paper. 22 x 30 in. Untitled (Hunt's Point), Late 1980's. Watercolor on paper. 22 x 29 1/4 in. Untitled (Win Lotto), Late 1980's. Watercolor on paper. 29 x 21 1/2 in.